Webcast: What Is the Source of Potato Psyllids Colonizing Potato Fields in the Pacific Northwest? What Is the Source of Potato Psyllids Colonizing Potato Fields in the Pacific Northwest? Summary: The outbreak of zebra chip disease in potato fields of Washington, Oregon, and Idaho in 2011 has led to substantial disruption of established IPM programs in potatoes. Managing zebra chip disease requires controlling potato psyllid, the insect which vectors the bacterium causing the disease, and uncertainties in understanding biology of potato psyllid in the Pacific Northwest has forced growers to rely on calendar-based applications of insecticides to prevent establishment of infective psyllids in their fields. 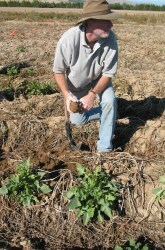 This presentation will examine the possible role of two non-crop host plants of potato psyllid – bittersweet nightshade and matrimony vine – as possible “bridge” hosts between late winter emergence of potato psyllid from overwintering quarters and late spring emergence of the potato crop. Understanding psyllid biology on non-crop plants in the Pacific Northwest will allow growers to better predict when seasonally and in what fields potato psyllid is likely to first arrive.